There has been a lot of sewing going on around here. First this pillow and then this one. I have a few more to share. Maybe in a few days? Don't want you to get sick of seeing pillows. Stop it! I'm getting jealous of all your cool pillows! Oh I have such pillow-envy! 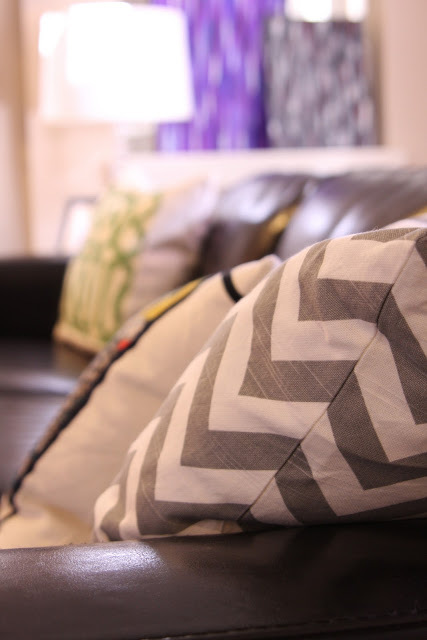 I've got a pillow crush on that grey chevron - oh yes I do! You are so talented. That black and white pillow is gorgeous. I just ordered some fabric and cannot wait to make some pillows. Guess whose tutorial I will be using? WOW! I love BOTH of these pillows. So graphic and fun. Oh I don't think I could get sick of seeing your wonderful pillows. I think you should take that Etsy idea seriously. You may some fab pillows. I love the way you matched up the stripes in the black and white one. I am anxiously awaiting my mega load of fabric that I ordered last week from Kravet (they had a fab sale). Not too sure what I'm doing with it all but I hope to make some fab pillows out of some of it. I'll be checking out your blog for pillow inspiration! Love the fabric! I was at Ikea last week and there was a tag on the fabric saying it was going to be discontinued! MAJOR Bummer, so buy it up now- while you still can! You are seamstress extraordinaire!! Those are great but I'm highly impressed that all your seams line up so perfectly. Oh how I wish I could just whip up my own pillows- these are all fabulous...love love! I never get tired of seeing your pillows! Love all of them, and really feel for the gray Chevron. Yes please! PS - you might get 2 comments, I don't know where my first one went! I drool over these pillows - I especially love what you did with the black and white stripes. So cool! I'm lovin' that grey chevron .... you are just a little factory going on over there! Keep up the good work! Never too many pillows! I love how the grey chevron pillow matches your blog background! Did you plan that? LOL! As usual, your sewing projects turned out amazing. I am literally drooling over these pillows. LOVE it Barbara!!! I love the gray/white stripe and floral pillow combination!! Barbara...those are all fabulous!!! I need to get my sewing machine back from my sister...pronto!! !